A lot of our code, and probably yours, is highly relying on text process. In our mORMot framework, most of its features use JSON text, encoded as UTF-8. Profiling shows that a lot of time is spent computing the end of a text buffer, or comparing text content. 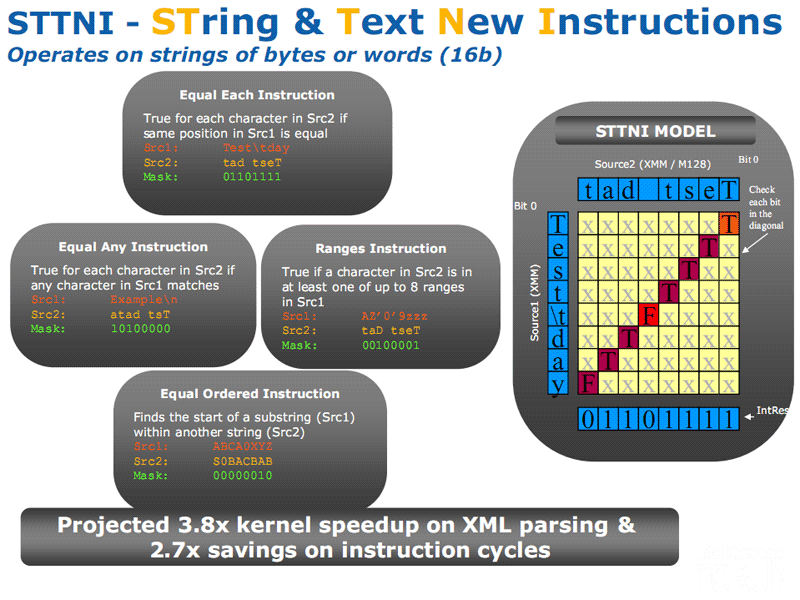 You may know that In its SSE4.2 feature set, Intel added STTNI (String and Text New Instructions) opcodes. They are several new instructions that perform character searches and comparison on two operands of 16 bytes at a time. I've just committed optimized version of StrComp() and StrLen(), also used for our TDynArrayHashed wrapper. The patch works from Delphi 5 up to XE8, and with FPC - unknown SSE4.2 opcodes have been entered as hexadecimal bytes, for compatibility with the last century compilers! The resulting speed up may be worth it! Next logical step would be to use those instruction in the JSON process itself. It may speed up the parsing speed of our core functions (which is already very optimized, but written in a classical one-char-at-a-time reading). Main benefit would be to read the incoming UTF-8 text buffer by blocks of 16 bytes, and performing several characters comparison in a few CPU cycles, with no branching. Also JSON writing would benefit for it, since escaping could be speed up thanks to STTNI instructions. Any feedback is welcome, as usual!